Now since day two of training camp was closed to the public, I decided to take a different approach and instead provide a brief scouting report on every player expected to make the Jets, as well as on a few other players of note. Enjoy. 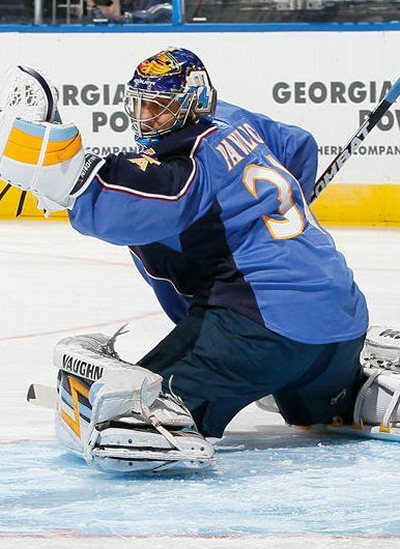 Ondrej Pavelec: When he came out of junior hockey in 2007, many scouts saw Pavelec as the best goaltending prospect outside the NHL. In his first year of pro hockey, he did nothing to dissuade those opinions, as the rookie goalie led the AHL’s Chicago Wolves to a Calder Cup championship. Last season he began the NHL season as a backup but took the starting job in November from Chris Mason. He had periods of inconsistency, but also had stretches of dominant play (see link below) where he showed tremendous potential. He has the potential to be one of the better goalies in league, and his play this season will be the biggest determinant of whether the Jets make the playoffs. Chris Mason: Mason is a hard-working veteran who’s shown great determination in his career. It took him eight years of pro hockey before he made it the NHL, and another three before he became a starter. He always makes the most of his opportunities, and he’ll be a good mentor because he’ll challenge the young star without overshadowing him. He should play 25-30 games and will be a good second option in net should Pavelec falter at any point. Tobias Enstrom: Though he stands at only 5’10, 180, he makes up for his lack of size with great anticipation, a quick stick, and a fluid, effortless skating stride. He’s been one of the most underrated defencemen in the league for a few years now, and is one of only two defencemen in the NHL to put up 50 points in each of the last two seasons (only other is Dan Boyle). He’s easily the best defenceman on the roster, and will be counted in to play big minutes in every situation, just as he did last year where he averaged nearly 24 minutes a night. Zach Bogosian: While Enstrom is the Jets’ best defenceman, Bogosian may be the most gifted. He’s 6’3, 215, but possesses the speed, quickness, and agility of a far smaller man. He’s strong as an ox, and possesses a hammer of a shot. Sadly, because of his physical maturity and athleticism, he was rushed to the NHL and hasn’t progressed at the same rate as fellow 2008 draftees like Drew Doughty, Alex Pietrangelo, and Tyler Myers. Bogosian has all the physical tools to be a star, but at just 21 years of age, he still needs more time to acclimate to the speed of the NHL and the off-ice demands of being a pro hockey player. He’ll probably see lots of ice-time this season, particularly at even-strength where his exceptional skating ability is most advantageous. Dustin Byfuglien: Byufuglien skates remarkably well for a man who’s 6’4, 265 lbs. He also has a huge shot and very soft hands. He played defence throughout junior hockey and his early pro career and was converted to forward in 2007, before famously switching back to defence at the beginning of last season. Last season was a tale of two seasons for big Buff – he was absolutely dominant in the first half, with an astonishing 41 points his first 42 games, before crashing back to earth with only 12 points in his last 39 games. There’s also the matter of his weight, as he managed the equally incredible feat of gaining 19 pounds during an NHL season. Nevertheless, Byfuglien will again be expected to provide offence from the back-end, especially on the powerplay where he and Enstrom form a great 1-2 tandem. Ron Hainsey: Though he’s often criticized for his hefty salary, Jets fans should come to appreciate Hainsey – a veteran two-way defender who can do a bit of everything. When he first signed with Atlanta in 2008, he was counted on for his offence, but with ultra-skilled players like Enstrom and Byfuglien in the line-up, Hainsey has settled into more of a defensive role. He was the only full-time Thrashers defenceman with a positive +/- rating last season, and he’ll be counted on this season to provide even steadier defensive play – particularly on the penalty kill where, the team finished 27th in the league. Johnny Oduya: A good skater with average size, Oduya is a pretty good NHL defenceman. He makes a good first-pass out of his zone and is reliable defensively, but he’s not going to put up big points or shut-down the game’s elite talents. Originally acquired in the 2010 deadline deal which sent Ilya Kovalchuk to New Jersey, Oduya seems to be nearing the end of his brief stay with the franchise. He has only 1 year left on his $3.5M contract, and with young defencemen like Paul Postma and Arturs Kulda nearing NHL readiness, that money would be better spent on a forward than a #4/5 defenceman. He’s been linked to Montreal in trade rumours, and there’s a good chance that he’ll be dealt at this year’s trade deadline, if not before. Mark Stuart: Big, strong and very physical, Stuart is a defensive defenceman through and through. He has limited puck-moving ability, but will be a fixture on the penalty kill, blocking shots and knocking down opposing forwards who venture in front of the net. His contract (3 years x $1.8M) is a bit hefty for a player of his skill-set, but his stay-at-home style provides a good complement to a group which is prone to taking risks offensively. Randy Jones: A veteran defender, Jones is here merely to provide depth. He has decent hands, but has struggled defensively in recent years because he lacks speed. He is penciled in as the 7th defenceman, as he’s the last defenceman on the roster with a *one-way contract. It’s unlikely that he’ll be with the team this time next year. *There is sometimes confusion about one-way vs. two-way contracts. While anyone can be sent to the minors (unless they have a no-movement clause), a two-way contract will pay different amounts depending on whether one plays in the NHL or the AHL; AHL players commonly make $50,000-$70,000, whereas the minimum NHL salary is just over $500,000. If a player with a one-way was sent to the minors, he’d still make the NHL salary. Derek Meech: A smaller defenceman with pretty good hands and skating ability, Meech has a two-way contract and looks to be the “#8 defenceman”, or first call-up. He has a few years of NHL experience with the Detroit Red Wings, and is a good team-first guy who’s quiet and won’t bring any drama to the rink. A Winnipegger, Meech is the type of character guy the organization is looking for, and should be valuable in a depth role. Paul Postma: A player with great offensive ability and a good skating stride, Postma is the Jets’ best defensive prospect. He’s put up impressive offensive totals in his first two years of pro hockey (AHL), scoring 27 goals and 74 points. He’s only 22, and with guys like Jones and Meech around to provide depth, the Jets can take their time with Postma and allow him to develop his defensive game in the minors, and also fill-out his lanky frame. Arturs Kulda: A solidly built defenceman with a rugged style, Kulda hails from Riga, Latvia. With three years of pro experience under his belt, he may be ready to take an NHL job in the near future, though it doesn’t appear that the Jets have left a spot for him. Barring injury, he doesn’t have much chance of making the team out of camp, but he’ll be a good call-up option, and should be in the team’s long-term plans. Evander Kane: Simply the most talented forward on the roster. With two NHL seasons under his belt, he may be poised for a breakout year. See his player profile for a more detailed look. Bryan Little: Not as talented as Kane, but maybe just as important to the team’s success. He plays a complete game and received more ice-time last year than any forward not named Andrew Ladd. See his player profile for more info. Alex Burmistrov: The slickest player on the roster, Burmistrov invites comparisons to Pavel Datsyuk because of his ridiculous puck control and highlight reel goals. He was rushed to the NHL as a teenager and faired poorly, putting up only 20 points, but it’s no indication of his talent. He’s dynamic and exciting to watch, but it’s hard to know what type of production to expect from him as he’s still technically a teenager. (He turns 20 on October 21). Fans and management will need to be patient with him, and the coaching staff will need to put him in situations where his skill and creativity can flourish. Expect to see a lot of him on the powerplay, and a bit less at even-strength. Andrew Ladd: The first captain in Jets-redux history, Ladd is a complete player with good size, skill, character, and work ethic. A two-time cup winner, his experience is particularly valuable with such a young group. While he led the team in scoring last season, he’s probably only talented enough to play on the second line of a more competitive team. Evander Kane should take his spot as the top-line left winger in the near future –possibly as soon as this season. Blake Wheeler: Back in 2004, scouts looked at Wheeler and saw a tantalizing combination of size and skill that was too good to pass up. The 6’5 winger was drafted 5th overall by Phoenix – one spot after Jets captain Andrew Ladd. He spent three somewhat underwhelming years playing college hockey, and then inked a contract with Boston in 2008 (rather than Phoenix – similar to Jason Gregoire who was drafted by the Islanders but signed with the Jets). He had a very good rookie year, scoring 45 points and helping to solidify a very effective second line along with David Krejci and Michael Ryder. However, his play dropped off a bit in the following two years, which culminated in him being dealt to Atlanta at the trade deadline last season. While no one has ever questioned his skill, his effort and intensity were sometimes perceived as unsatisfactory. He did end last year on a high note, scoring 17 points in his last 23 games with Atlanta, largely benefitting from additional playing time. He signed a two-year contract this summer, and will be given every opportunity to take a spot as the first-line right winger. Nik Antropov: A controversial figure in most places he’s been, he often leaves people wanting more. Though he stands 6’6, he’s always been criticized for playing like he’s 5’6. Similar to Wheeler, he has a calm, quiet demeanour which sometimes makes him look lazy on the ice, raising the ire of fans and coaches alike. He’s actual developed into a pretty consistent offensive threat, recording point totals of 56, 59, and 67 in the past four years. He had only 41 points last season, but was slowed in part due to off-season hip surgery. With two years left on a contract which pays him over $4M, he’s often cited as the team’s most overpaid player. He likely has no long-term future with the team, and may even be dealt at some point prior to the contract’s expiration. Kyle Wellwood: Another player who’s been criticized for his lack of effort, Wellwood is a small centre with great hands. He’s talented and creative with the puck, which makes him well-suited to a powerplay role. He’s also good on face-offs. In addition to being small, he’s not fleet of foot, in part because he’s never taken his conditioning very seriously. He’s likely here for just a year as a stop-gap measure – an indication that this organization doesn’t want to rush ill-prepared youth to the NHL as their predecessors in Atlanta. It’s a great sign, and a welcome relief for anyone who’s seen young players hurt or even ruined by the “too much, too soon” phenomenon. Jim Slater: His game is all about effort – he’s fast, gritty, and defensively responsible. He’s versatile – good on face-offs, but also can play the wing. He was hurt much of last season, and some say the penalty kill got worse when he was out of the line-up. Now healthy and playing for a new contract (free agent next season) he’s the best checking forward available to Claude Noel, and will be heavily relied upon in defensive situations. Chris Thorburn: Slater running mate in the bottom-6, Thorburn is a big guy who plays a gritty type of game. He’s embraced a role as a checking line player and is one of team’s top penalty killers. He won’t produce a lot of offence, but he’ll give you a consistent effort every night. Tanner Glass: Another fellow in the mould of Slater and Thorburn, Glass is gritty and will be counted on to play in defensive situations this season. He has limited offensive ability, but he plays a physical game, and will work hard every night. Eric Fehr (IR): Fehr is a goal scorer that has had limited opportunities thus far in his NHL career. He’s dealt with a number of injuries, suffering numerous back and shoulders problems. When healthy, he often found himself buried in the Washington line-up, unable to get the powerplay time he needed to gain confidence and produce offence. A native of Winkler, Manitoba, he was acquired this summer from Washington for a fourth round pick. He’s currently recovering from off-season shoulder surgery and is out till at least November. Patrice Cormier: Cormier played only 21 NHL games in his rookie season, missing significant time due to injuries – a broken foot early on, and a concussion later in the year which ended his season. A physical player, he became infamous in early 2010 when he delivered a devastating elbow to an opponent’s head which garnered him a 20 game suspension by the QMJHL. While he says he regrets the hit, which happened as “a reflex”, he threw a similar (but less severe) elbow at the World Junior Championships just a few months prior. With that type of track record, it’ll take at least a few years of clean play before he’ll be able to shake the reputation of being a dirty player. He has the potential to be a 3rd line centre who will shut-down the opposing team’s best players, but after an injury plagued year where he lost considerable development time, he is probably a way’s from being an effective checking forward. He could end up as a depth forward for the Jets this season, but at 21, he might be better served by playing bigger minutes in the AHL. Kenndal McArdle: Another former Canadian World Junior player, McArdle is fast, gritty, and works hard. A 1st round pick who put up good numbers in junior hockey, that offensive ability has been notably absent since he turned pro. However, after 4 years of pro experience split between the AHL and NHL, he may be in a good position to win a spot in the bottom-6, as many of the players he’s competing against are not well suited to a 3rd or 4th line role. Ben Maxwell: Fast and skilled with average size, Maxwell has been a very good AHL player for a few years now, but hasn’t been able to translate his offence to the NHL level thus far. Hard to say where he fits on the NHL roster, as there aren’t any spots available in the top-6, and he’s probably not the best candidate for a checking role either. He may be a bit of a ‘tweener’ – a skilled player who can produce offence at the minor-league level, but who doesn’t appear to have a role in the NHL because he lacks some other essential attribute – usually size, speed, skill, or some combination thereof. Spencer Machacek: Has produced pretty good offensive numbers in the AHL, but like Maxwell, hasn’t been able to duplicate that in the NHL, albeit in brief opportunities. He’s a hard working player who might have some potential as a checking line forward, but might not be ready to fulfill that role just yet. Tim Stapleton: Though he played 45 games in the NHL last season, the signing of Kyle Wellwood might be Tim Stapleton’s ticket to the minor leagues. At only 5’8, and with small centres scattered throughout the line-up already (Little, Burmistrov, and Wellwood), he doesn’t have the attributes of a traditional 4th line forward. He played only 7 minutes on the penalty kill all of last season, and he isn’t particularly good one face-offs. While his contributions to the NHL roster would be limited, he would be a huge addition to the AHL line-up. He scored 79 points with the Toronto Marlies a few years ago, and would be a valuable first-line centre for the Ice Caps. His only saving grace may be that he has a one-way contract – he’ll be paid $525,000 this season regardless of whether he plays in the AHL or the NHL. While Troy Bodie, Janne Pesonen, and David Koci are not under contract, they all received training camp invites. You can read more about them here. This entry was posted in Winnipeg Jets and tagged Bryan Little scouting report, Evander Kane scouting report, Winnipeg Jets, Winnipeg Jets depth chart, Winnipeg Jets players, Winnipeg Jets Roster, Winnipeg Jets scouting report, Winnipeg Jets training camp by Peter Siamandas. Bookmark the permalink.